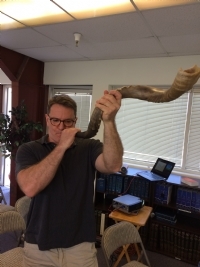 Shofar Sho good! A BLAST of a time learning about Rosh Hashanah and making our own, real shofars. From start to finish, we sawed, sanded, drilled and shellacked our shofar, and even learnt how to blow it!! Thanks Mendel Rice and Michael Shoshan for helping with the power machines. A Packed house at the Hamantashen Bakefest. The feedback was AMAZING! After learning more details of the Purim story and its powerful significance in our lives today, the kids rolled up their sleeves and got messy with oil, eggs, dough and sugar and made beautiful Hamantashen with our Yummy filling bar. Chanukah is in the air!! 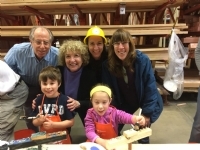 175 eager children and adults came to the annual Menorah Workshop at Home Depot. Familiar faces, as well as many new ones, learned about Chanukah and how each and everyone of us can be modern day Maccabees! The smiles on the children's faces says it all! We had so much fun gearing up for Purim with a packed house gathering together to make and bake delicious Hamantahsehn. The children learned all about the Happy Holiday of Purim and it's relevant meaning. 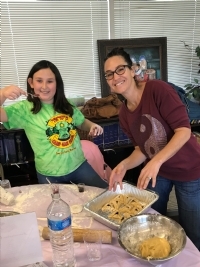 Each family baked their own dough, shaped their own Hamantashen and filled them with 10 different flavor fillings!! What an awesome way to get in to the High Holiday spirit! Over 50 people joined in learning about Rosh Hashana thru a Tashlich toss, a special bee keeper presentation, and a variety of fun booths, run by a group of dedicated volunteers! 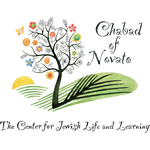 Thank you Amit Kadoch, Michelle Frid, Alex Sheron for you help! Shana Tova - May this year be one filled with Jewish memories and learning! 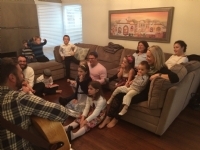 An amazing time welcoming Shabbat with warmth, love, music and delicious Challah! 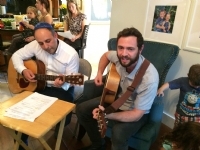 Thanks Jonathan Khersonsky and German Pinkhasova for rocking the Shabbat songs on the guitar!! Woah! 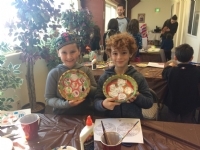 150 children brought the Chanukah spirit and the strength of the Maccabees to Marin this morning! The joyous energy of this event, with children and grandparents building their very own Menorah was truly a sight to enjoy!